I hope to inspire and share with others scrapbooking, card making and altered arts. This weeks challenge for Just A Scrappin' Blog is a card, LO or 3D project using any animal, embossing and 3 buttons. 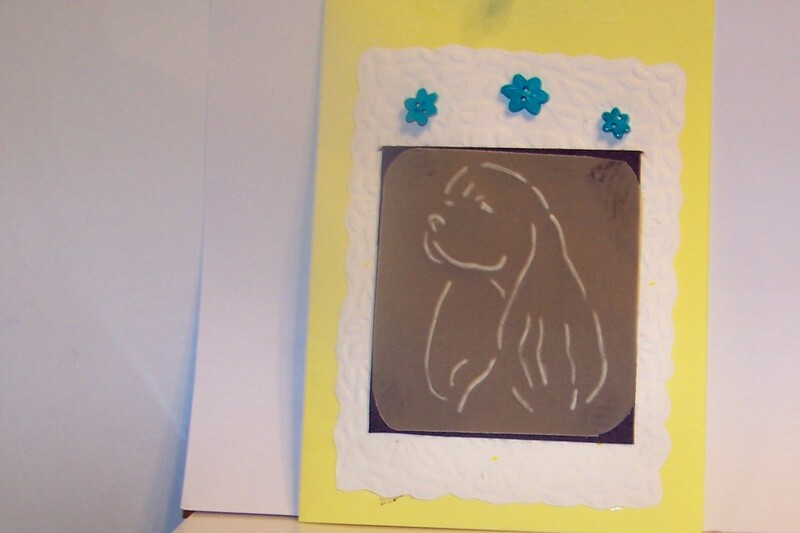 Here's the card I made using my chalk's stencil that I had better luck embossing than the embossing patterns. Love the way my dog showed up - looks like my dog Buffy. It was harder than I first expected after watching youTube how-to. I do not think I'll do this again by hand. This is a really neat technique... Love the card! I've never seen this technique before. Very nice. TFS! I found using the larger chalk stencil worked best for me. you can find more on YouTube on this technique. Very nicely done. I love dogs and cats and this is a cute project. sherry butcher I now live in New Mexico with my 7 year old dog Blackie. *I started scrapbooking in the mid '90. Using scrapbook magazines and crops I scrapped a lot of different styles. I still us challenges to keep developing my scrapbook style. In 2011 I started making cards for other than just family, doing cards for groups that help others like Operation Write Home and Smiles 4 Kids. *The best thing is being selected to be on the Design Team at Just-a-Scrapin'!